My first attempt at a comet. 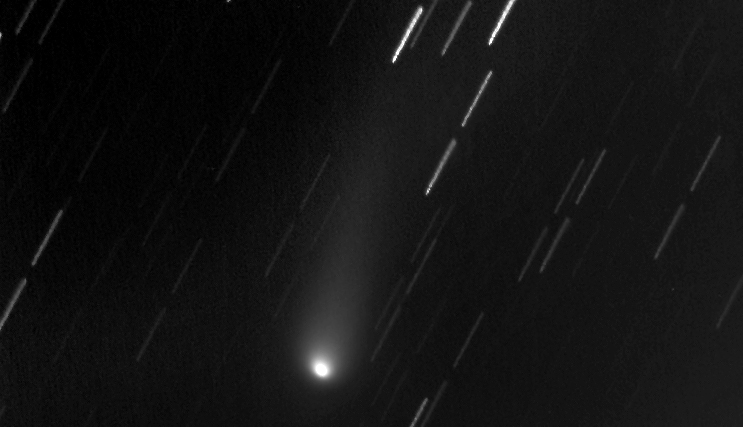 This is comet LINEAR C/2002 T7 or more commonly just "T7". There are 120 frames each exposed for 30 seconds. The frames were aligned on the comet head and then added together. Since the comet is moving relative to the stars, the stars appear trailed. If you observe carefully you will note that each star trail has a brief break in the middle. This is were I paused after the first set of 60 frames to refocus. You might also notice that the top half of the star trails is crisper than the bottom half and that the bottom part of the bottom half is crisper than the top part of the bottom half. I believe this is due to temperature variation during the exposures which is enough to change the focus of the optics. The temperature was dropping rather quickly during the first 60 exposures and was more stable during the latter 60 exposures.